When Dustin Kott turns his hand to a CB, you can be sure it’s going to come out special. The Californian builder has favored Hondas since he first popped up on the scene—and to call him a specialist would now be something of an understatement. At the core of the build is a CB750 Super Sport fuel tank, enhanced with knee and steering indents and a tidier filler cap. 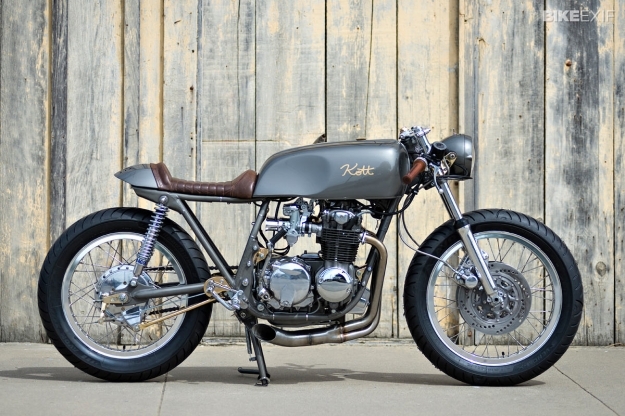 Kott is a master metal shaper and hand-built tail pieces are a signature of his. This one was fashioned from round bar and sheet steel to complement the tank. Once the frame was modified to accept the new tank and seat, it was stripped and given a glossy clear coat, resulting in a golden grey finish. This monochromatic feel was carried through to the rest of the build, punctuated by some tasteful brass bits. These include plated mesh steel inserts on the tailpiece and rear hub. 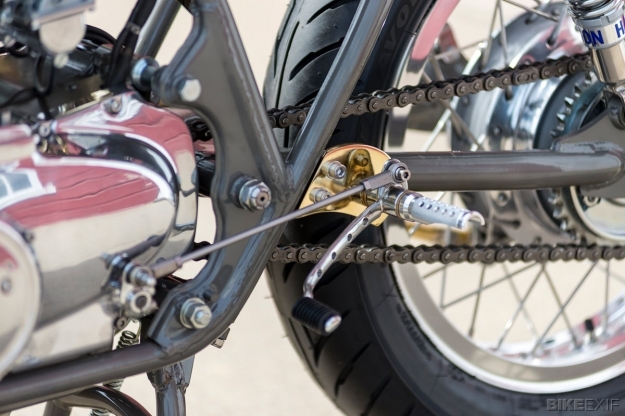 Kott also hand-cut brass mounting plates for the rearsets, which he made using the stock Honda brake and shift levers. 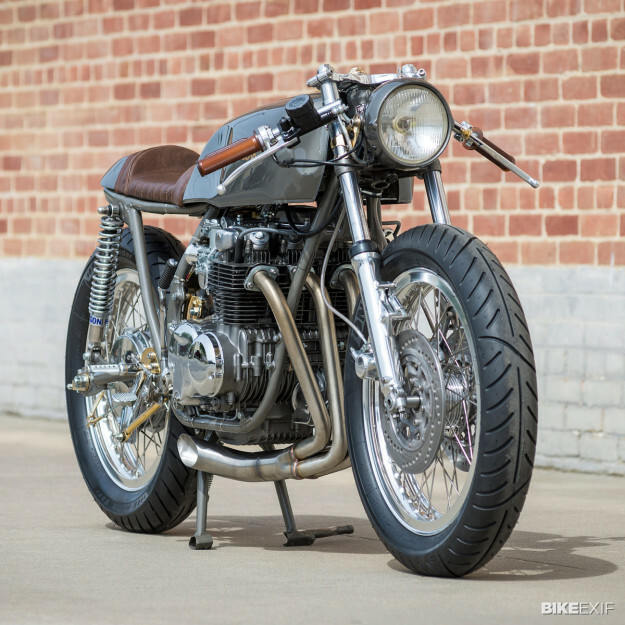 The CB’s engine received a full rebuild, maintaining its stock displacement of 544cc. The carbs were restored too, and re-jetted to accommodate velocity stacks. These are tucked away safely behind a clever, removable brass splash plate. Stainless steel four-into-one headers and a custom-made muffler were added for a performance boost. Braking was enhanced via an additional drilled rotor up front. The fork tubes were then reversed so that dual trailing calipers could be installed. For a new wheelset, Excel shouldered aluminum rims (19” at the front and 18” at the rear) were laced with stainless steel spokes and wrapped in Avon tires, giving “the bottom half of the motorcycle a stout and sturdy look.” Thanks to new fork internals and Hagon shocks, the bike is better sprung now as well. 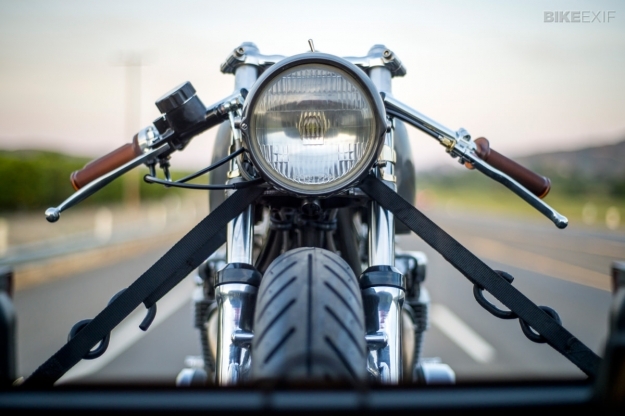 The electronics also got some attention: there’s a four-cell battery hiding in the seat cowl, and the bike’s been completely rewired with solid state components and a LED tail light. 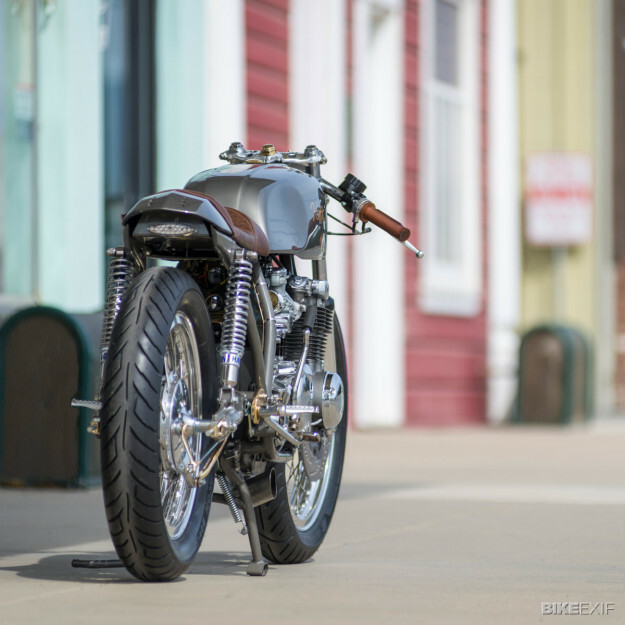 A ’60s-era pressed steel Honda headlight was fitted, the same type that you’d find on a SL350 of that vintage. Sounds about right. 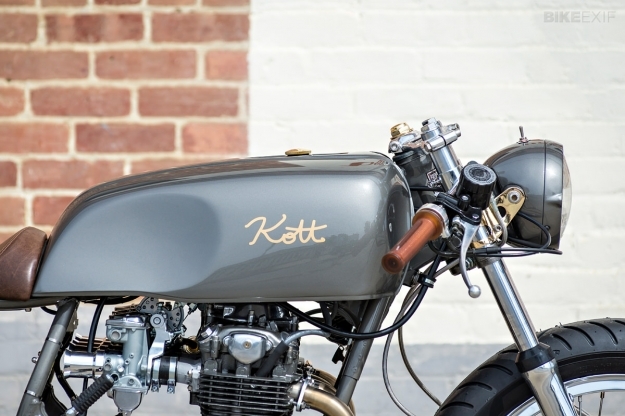 Head over to the Kott Motorcycles website to see more of Dustin Kott’s super-classy builds.